You know a review item is worthwhile when you already own parts of it! As a member of the TOS Homeschool Review Group, I was fortunate enough to receive several products from Master Innovations, LLC. This company strives to create math and measurement materials that are hands-on and visual. Basically the more involved the student can be with the material (meaning the more senses used to experience the material), the better the student will understand and internalize a concept. I received the Master Fractions Set and Marvels of Measures poster. 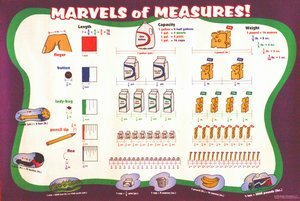 We already owned the Marvels of Measures poster and I can not express what a valuable resource this has been for our homeschooling classroom. The pictures clearly display the concepts and use common objects that the students can quickly identify and relate to. Even my four-year old can easily identify the relationship between cups and pints by using this poster. The poster makes a nice large classroom display and can be bought from Master Innovations website for only $10.00 (I paid more for the poster from another site). The Master Fractions Set that I received contained the Master Fraction transparency books 2, 3, and 5 as well as the Master Fractions Workbook. As the name suggests, the transparency books are spiral bound books with transparent pages that clearly illustrate fraction concepts. Each book displays a square, rectangle, and circle being divided into halves, thirds, fifths, or a multiple of those fractions. The workbook contains simple written instructions as well as activities to promote learning with the transparency books. These aspects of the program are also quite affordable. The transparency books come as a set for $17.95 and the workbook is only $15.95. There is also a teacher book designed for use on an overhead projector that is only $17.95. For a complete listing of the items available and their pricing, CLICK HERE. Other programs from Master Innovations, LLC include: The Master Ruler, The Master Clock, and The Master Angles. All products within the programs are of high quality and affordable value. It was great using this program within our homeschool. The concepts were easy to teach and clearly illustrated. There are videos available demonstrating the concepts, and I found these interesting and informative. Isaac and James both enjoyed the workbook; which presents the lessons in a story-type format. It was difficult for Isaac (age 6) to really master using the transparency books, but James (age 8) quickly caught on and referenced them even when he didn't really need to. At one point he said, "I never really understood the parts to a whole concept until you showed me these books." Overall I think that the products I reviewed made a wonderful supplement to our already existing math program. I will not hesitate to purchase the other products if I feel they would benefit my students, nor would I hestitate to recommend this product and company to the many homeschooling families that I know. Disclaimer: As a member of the TOS Homeschool Review Group I received several Master Fractions Products free of charge in exchange for an honest review on this blog. I received no other compensation. Enjoyed your review. We loved the overlays, too. I may have to take a look at these (speaking as someone who still has to think really hard to remember how many cups are in a pint).